It is used for the screw of the replacement plate of the button battery for the remote control of a favorite car. With conventional mini-drivers such as watches, the handle rotated around and it was inconvenient. I am satisfied that I can find and purchase neat fixation. This review is about item#39515156. Quality is no problem because it is a standard Bessel. As this part of the micro driver is rotated, it is extremely easy to use and convenient to rotate with a screw while pressing the screwdriver. I think that this driver is perfect if it is a use requiring detailed work. I am using it to adjust the machine but it is very easy to use and familiar hands. This review is about item#10006017. It is better than using it as a flathead screwdriver because its length is just right, there is something in machine maintenance. This review is about item#39515183. Power is firmer than ordinary precision driver, it is easy to use. I will continue to patronize it. There are variations of length in the series you have been using before and it is useful. This review is about item#39515165. It is easy to use, but if there is color coding by tip size, will it become easier to use? This review is about item#39515131. Because it is always used, it will fit in hand. The price is also cheap. The length of the driver is perfect for iPhone repair and easy to use in a rabbit. Because it fits to any screw, repair time can be shortened. I have repaired it because I lost it. 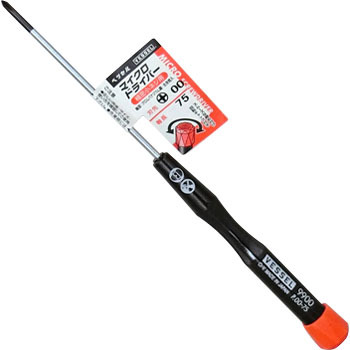 It is stronger than the precision screwdriver set and does not take up space, it is one of the standard tools. Rather than buying a precision screwdriver set, it is better to buy neat things by purpose, but the result is a shortcut.One of these glasses plus screws is OK with this one. I purchased it by being recommended by a friend of electric machinery. Although I asked for it as my own, I was told that I wanted it from a local subordinate and handed over. It seems that both strength and accuracy are satisfied. I purchased it for myself again. I tried it with bolts of M2 but I firmly clenched it. It is comfortable. This review is about item#39515174. Purchased with a friend introduction. I bought it for the sake of the principal and for the men working in the foreign country (China). The stability feeling when tightening small screws is satisfactory. What I bought a long time ago was polished, but this time it was matte with plating. If anything, the previous one looks better and likes. I used the same thing, but the tip part got useless, so I bought a new one. I do not have any problem in terms of price, and I can not help exhausting it, so I think that it is easy to use. Alignment of cylinder switch etc. This driver also has a similar shape since I was young, and the yellow part and the red part of the head have been improved. Because the tip finish is good, it lasts long lasting. Replacement of personal computer parts etc. The frequency of use is the highest driver. Especially it could be used without problems.